Through the years, many patients requested that we carry compression stockings. We now have an inventory of high-quality Swiss made compression stockings by Sigvaris. Depending on the patient’s insurance plan, we may be able to provide these to the patient at their initial visit. Compression stockings can be an integral part of leg venous health. Many patients are advised to use compression stockings as part of their pre or post-procedure care regimen. Insurance companies often require a trial of compression stockings (usually six weeks to three months) before they will cover any medically indicated vein procedures. Stockings are commonly advised after varicose vein and spider vein treatments. Compression stockings are worn anywhere from a few days to several weeks depending on your individual treatment. Compression stockings may also be advised for general leg health long term in patients with a history of vein problems. They will often decrease leg fatigue with prolonged standing or immobility, and are great for long plane trips or car rides to decrease swelling. Some studies have even suggested that compression stockings may decrease the chance of blood clots with air travel. Compression stockings come in several different levels of graduated compression. The compression differences keep blood from pooling in the feet or ankles and aid in overall return of blood from the leg to the central circulation. Compression stockings use different elastics throughout the stocking to create more pressure at the ankle than the calf or knee. Compression levels vary from one stockings manufacturer to another, but are typically measured in a narrow range of millimeters of mercury (for example, 20-30 mm Hg). The lower number indicates the pressure at the calf and the higher number is pressure at the ankle. The higher the numbers in the range, the greater the level of compression. If compression therapy is necessary for your treatment, one of our medical specialists will measure your feet, ankles, and calf, and prescribe a specific size and level of compression that is unique to your treatment. Many people have tried stocking that just did not feel comfortable. We would advise you to get properly fitted by a specialist such as at Lake Washington Vascular, and try stockings of differing styles or materials. Just like at a shoe store, a size 9 in one brand may fit totally differently than the same size in another brand. Some patients have difficulty putting these medical grade stockings on. Please ask our specialists if you would like to learn about the many aids and adjuncts to help with the wear and use of compression stockings. 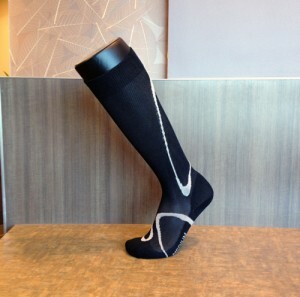 There are other compression garments other than stockings, such as footless calf sleeves or arm sleeves, available. Stockings are the most commonly prescribed compression garment at Lake Washington Vascular. Athletes, such a joggers and marathon runners, are discovering the benefits of athletic-grade compression stockings. For more information on compression stockings and compression garments, please visit our Compression Stocking Manufacturers in our Vascular Health Resources section.